I ususally fish freestone, cutthroat streams. I like dry flies and beautiful scenery with lots of solitude. But I have fished a few tailwaters and spring creeks. So I understand the need to fish tiny flies to discerning trout. Even after some experience and the usual magazine articles, I don’t feel that comfortable with fine tippet and sub-20 sized flies. So when I came across a new book by midge masters, Rick Takahashi and Jerry Hubka, my eyebrows shot up and I grabbed it. 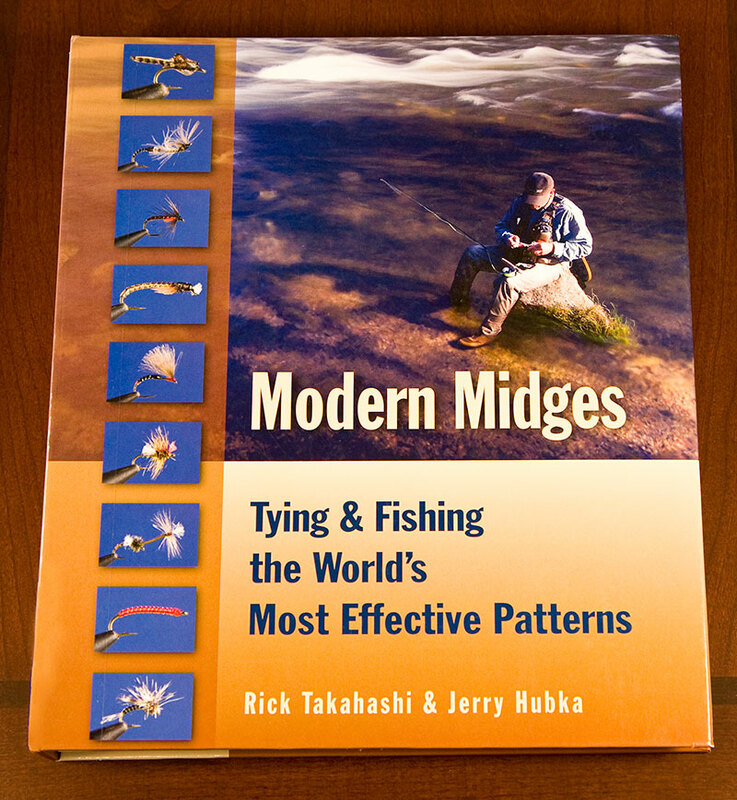 It is called Modern Midges – Tying and Fishing the World’s Eost Effective Patterns . What a book! Physically it is impressive. 9 1/2″ by 10 1/2″, hard cover, and spiral bound to lie flat when tying. It weighs in over 3 pounds. 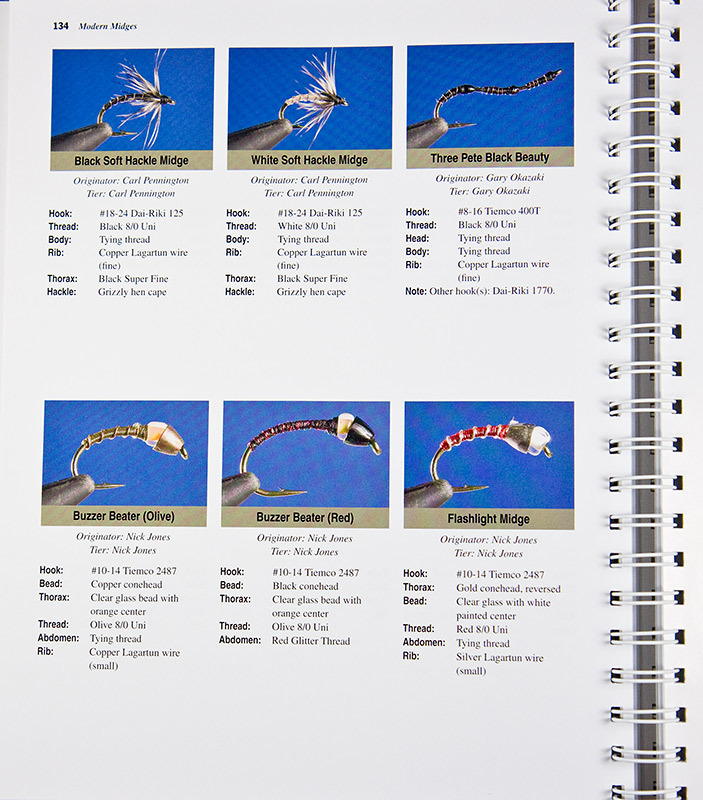 After only 6 pages of introduction, it jumps right into tying flies. Now that is my kind of book! The organization is logical and linear, following the life cycle of these little bugs. How to tie pupa patterns. Then 83 pages of pupa patters. How to tie emerger patterns. Then 47 pages of emerger patterns. How to tie adult patterns. Then 18 pages of adult and cluster patterns. share insights and tips on using those patterns you just learned to tie. Wow. The patterns are laid out six to a page so the pictures are large, razor sharp and easy to read. Sprinkled throughout are pictures of flyboxes with rows of beautiful flies; large fish with tiny flies in their jaw; and fishy water to drool over. 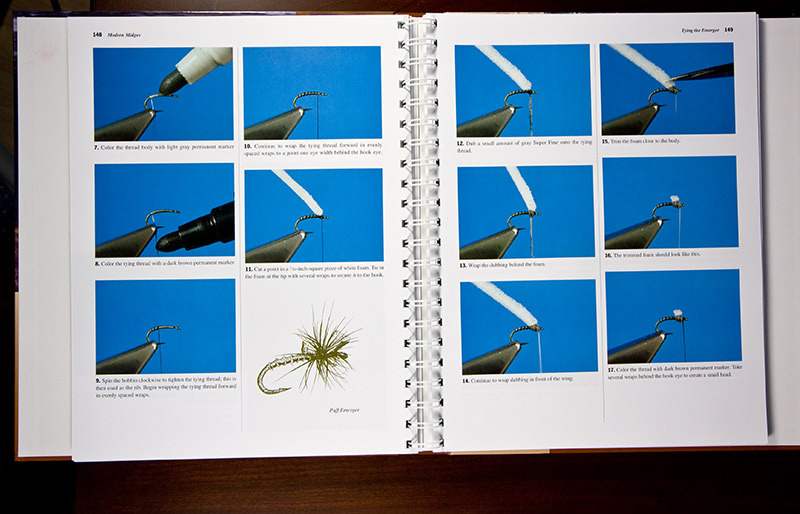 The book is a refrence for midge fishing, but the tips in the back apply to any stream or lake you might fish. arm yourself for battle, then this is the book for you. This is the kind of meaty reference book on which I’m happy to shell out my hard earned money. I know you will like it too.